with an entrepreneurial spirit that dates back to 1925. Once a bustling furniture factory, the Mastercraft building has been reimagined as office and community space for more than 50 startups, nonprofit organizations, creatives, and other entrepreneurial businesses. 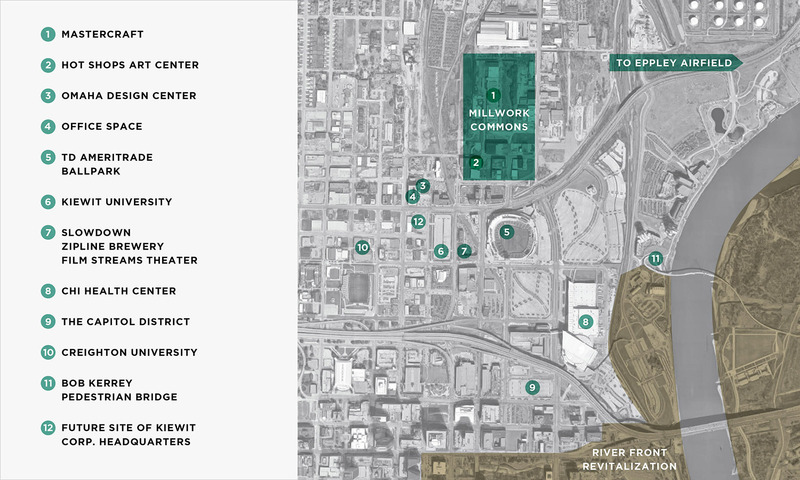 With ample parking and close proximity to TD Ameritrade Park, CHI Health Center, and Omaha’s downtown arts, music, and events districts, the Mastercraft is a place people come together to work, collaborate, and connect. The Mastercraft building is located in the heart of Millwork Commons, a collaborative office and residential community designed to inspire. The neighborhood will be a vibrant hub for technology, design, arts, cultural and community-focused institutions, and individuals. Work on Millwork Commons is underway and includes the restoration of historic buildings reimagined for the businesses of today and tomorrow along with complementary modern construction. Fast-growing companies like Flywheel are choosing the Millwork Commons neighborhood for its creativity, location, density, and walkability. The historic Ashton Building, constructed in the 1880s, will reopen in 2020. Millwork Commons will also include distinctive businesses to serve the neighborhood and its visitors such as coffee shops, restaurants, and services. In 1941, the Katzman family, owners of Mastercraft Furniture, opened a 140,000-square-foot-factory near 13th and Nicholas Street in Omaha. For 62 years, Mastercraft Furniture produced mid- to high-end furniture and sold it to stores in nine states. After the sale of the company in 2003, the Mastercraft sat empty. Attempts to sell the massive, rundown building — the length of nearly three football fields put end to end — were not successful, and it was finally put up for auction. This is where entrepreneur Bob Grinnell discovered it and purchased it in 2005 — on a whim. Grinnell repurposed the Mastercraft into a creative center, drawing small companies from the design, architecture, and technology industries. He took care to preserve the building’s high ceilings, clerestory windows, and rough sawn lumber joists as a nod to the building’s past while incorporating modern amenities for today’s companies. He enjoyed being hands-on in the renovations, often welding and pouring concrete himself. He stayed true to his vision of creating a community of entrepreneurs. In October 2018, Grinnell sold the Mastercraft to Paul and Annette Smith who founded and lead Black Dog Management. Black Dog purchased the Mastercraft Building along with the historic Ashton Building and the surrounding land. The Smiths’ vision felt familiar to Grinnell. They want to create a neighborhood that supports the businesses of today and tomorrow and further defines Omaha as cultural, vibrant, and inclusive. The Mastercraft is now the heart of a neighborhood undergoing revitalization: Millwork Commons. The Slowdown is a live music venue and bar, recognized in 2008 by Esquire Magazine as club of the year. Home to the to NCAA Men’s College World Series, TD Ameritrade Stadium is walking distance from The Mastercraft. Hot Shops Art Center consists of art studios, showrooms, and unique gallery spaces for local artists of various disciplines. Omaha’s convention center and arena hosts concerts, trade shows, exhibits, and large scale events. Film Streams is a non-profit organization devoted to the presentation and discussion of independent filmmaking.